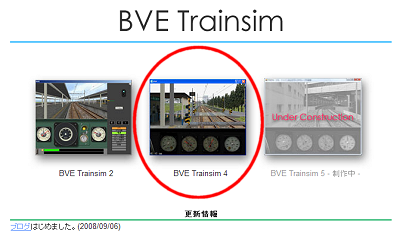 This page is designed to provide a brief introduction to BVE, allow new visitors to Rail Sim Routes UK to download and install the BVE setup files and default Uchibo route, and also help with the downloading and installation the routes and trains available on this site. This guide is designed for less experienced computer users, and the installation of my own routes is also explained. If you have a problem using BVE and it's not covered by this guide, then please visit Steve Green's BVE Help page for an alternative help guide. BVE (or Boso View Express) Trainsim is a freeware train simulator which offers an amazingly realistic cab view experience, developed by a sole Japanese developer Mackoy. BVE features some of the most convincing cab motion and rocking effects any commercial or freeware train sim has to offer, and is extremely flexible where route and train building is concerned, allowing very realistic representations of routes and trains to be created and driven. BVE also boasts some superb sound effect capabilities - if you enjoy listening to the sounds of wheels clattering over pointwork, flange squeal when rounding sharp curves, or for example the unique sound of 3 phase AC traction motors, then BVE is hard to beat! Important: BVE v4 requires the Microsoft .NET Framework, and if you use Windows 98, the Windows Installer as well. BVE itself requires only a modest system to run, the recommended minimum is a 266MHz processor, a functioning sound card which supports DirectX, and as much RAM as your operating system needs to run effectively. BVE is more fussy over graphics cards however, the best choice is a mainstream 3D accelerator designed for gaming such as cards in the nVIDIA GeForce or ATi Radeon ranges which usually work perfectly, although many other graphics hardware will work fine too - however it's possible that either your graphics drivers or Windows display settings may require some settings to be changed before BVE will work correctly, as is the case with some SiS graphics chipsets for example. Not all laptop display adapters will function correctly with BVE either when Direct3D acceleration is used, especially those not designed for 3D gaming, but many can work successfully with at least more basic routes, and detailed ones in some cases. BVE performance is very dependant on the level of detail contained in the route you are running, as well as the complexity and size of the route file being loaded. While a simple, less graphically demanding route will run on the minimum specifications, a highly detailed route with many textures, 3D objects and object placements will require far more CPU power for BVE to render it at acceptable framerates. For running the current generation of highly detailed routes without performance issues, especially with Windows XP, personally I would recommend the kind of system you'd want for running many of todays 3D game titles, e.g. a CPU running at 2GHz combined with at least 512MB of RAM, and a 64MB AGP graphics card such as an nVIDIA GeForce or ATi Radeon. Users of Western versions of Windows 98 may encounter difficulties using BVE v4, in which case you may need to install Japanese Language Support if BVE v4 fails to run correctly. Japanese Language Support can be obtained via Windows Update, or failing this, by opening Internet Explorer, going to the 'View' > 'Encoding' > 'More' submenu and selecting 'Japanese (Auto-Select)' - Internet Explorer should prompt you to install Japanese Language Support, and BVE v4 should then run after this is installed. Don't forget that BVE v4 requires the Microsoft .NET Framework, and the Windows Installer as well. BVE 4.2 can be successfully installed in Windows Vista (except you can skip the Microsoft .NET installation), however BVE v4.2 doesn't run within Vista without some additional work; this is because BVE 4.2 uses DirectX 8, however Vista supports only DirectX 9 and 10. Please read the additonal installation step at the bottom of this page for getting BVE to run in Vista; it may not work for everyone, but it's worth trying. Downloading BVE can be a simple procedure. Although the BVE homepage is Japanese, you do not need to use an on-line translation service. In fact, using such a service will prevent downloads from Mackoy's site from working! There is sufficient English text on Mackoy's site to guide you through the downloading of BVE. The first step is to find out whether you need to download the Microsoft .NET Framework, which BVE v4 requires to both install and run. If you use Windows Vista, you can skip this step. Some copies of Windows XP may come with the .NET Framework already installed. One way to find out is to try installing BVE v4 - if you don't have the .NET Framework the BVE v4 installer will tell you. You can also check if you already have it by seeing if you have this folder in your Windows directory: '<SystemDrive>:\WINDOWS\Microsoft.NET\Framework', where <SystemDrive> is the drive where your copy of Windows is installed. If you can't find this path in your Windows directory, then you probably need to download the .NET Framework. The second step is to visit Mackoy's BVE Trainsim website, to download the BVE simulator. Click this link to open Mackoy's site in a new tab (or window), so you can continue reading these instructions while you navigate Mackoy's site. < Next, you will be presented with several links. You want to click the "Get" image. < You will now be presented with a menu running down the left side of your browser window. The Outline page is already loaded; click the "Download" link. On the resulting Download Page, scroll down until you see the download links for the BVE v4 setup file and also the Uchibo download, BVE's default route and train pack. Click the bve4.2.xxxx.xxxxx.zip link, to start downloading the BVE setup file, which is a standard Zip format archive. Now also download the uchibo10.zip file. When choosing a location to save these files, I would strongly recommend creating a new temporary directory or folder, for example named "C:\Downloads\", in which to store your downloaded BVE installation files. The remainder of this guide will assume you download the BVE files into a folder named "C:\Downloads". BVE Trainsim's isntaller is distributed in a compressed archive; in this case, via the .zip format. Before you start downloading BVE itself, I'd recommend you first download and install the 7-Zip File Manager. The rest of this guide assumes that you've installed this program. If you've already installed a program like WinZip or WinRAR, you probably don't need to read a fair part of this guide anyway! Now you have downloaded the main BVE file(s), you're ready to prepare the BVE installation program. The following images depict the installation process in Windows XP. You now want to run Windows Explorer, and navigate your way to the folder in which your downloaded BVE setup files are stored. If you followed the advice given above, you want to find the 'C:\Downloads' folder you just created, otherwise replace 'C:\Downloads' with the pathname of the location where you chose to save your downloaded file(s). 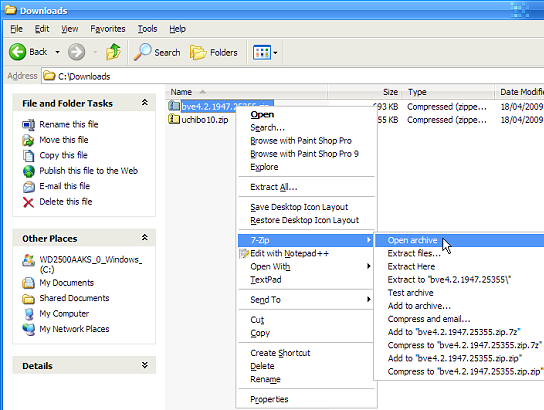 < You are presented with 7-Zip's window, showing the contents of the archive. Simply double click the "BveSetup.msi" file. < When you run 'BveSetup.msi', the BVE 4 Setup program appears. Click the Next button. Note: If BVE 4 Setup fails to run, you may not have the Windows Installer application installed on your system. Windows XP and Vista include the Windows Installer as standard; if you use Windows 98 then you may need to download the component from Microsoft's website here. < Now you can choose where you want to install BVE. I'd recommend leaving the installation directory as "<SystemDrive>:\Program Files\mackoy\BVE4\" (where <SystemDrive> may vary depending on where your Windows installation is located, in this case, 'C:\'), especially if this is your first attempt at installing BVE or it's add-ons. Once you've learned how BVE files are stored, you can change this option in future without fear of BVE failing to work properly after installation. Now click Next, and follow any on screen instructions. Files should now be copied, and the installer will let you know when BVE has been successfully installed. Before you attempt to run BVE, you need to ensure that you have at least one route and it's associated train installed. If you installed the Uchibo route and train pack as described above, then you can load this to check that BVE v4 is running correctly. Alternatively you can download and install my own Birmingham Cross-City South route using the instructions on the next page, as well as learn about BVE v4 keyboard and mouse commands. 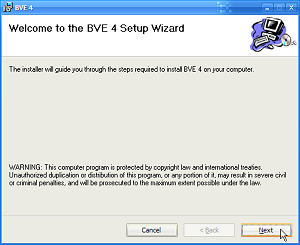 BVE 4.2 can be successfully installed in Windows Vista as per the instructons above (except you can skip the Microsoft .NET installation), however BVE v4.2 doesn't run within Vista without some additional work; this is because BVE 4.2 uses DirectX 8, however Vista supports only DirectX 9 and 10. Please read this thread on the RailUK forums for instructions on getting BVE 4.2 to run under Vista. It can be done with a little effort, although there are no guarantees that it will work in every case. < If you attempt to run BVE 4 without following the steps in the above linked forum thread, this is what happens when you start it. < BVE 4.2 (after Birmingham Cross-City South is installed, see next page), running in Windows Vista; read this thread on the RailUK forums for instructions on how to do this. Note: BVE 4.2 is not natively supported by Windows Vista, the linked-to instructions worked in my case, but may not work for everyone.